Cyber-Anatomy Med VR™ is an innovative system (hardware and software) for interacting with and visualizing anatomy. The system is built on advanced engineering and simulation technologies. Building upon the award winning software application called Cyber-Anatomy Med™, this system allows users to see in 3D, perceiving spatial relationships like never before. Cyber-Anatomy Med VR systems are used by health professionals and students at every level to show or learn anatomy. A user of the Med version, for example, can fully interact with the anatomy to "Peel" muscles, follow nerve roots, examine skeletal anatomical landmarks, understand muscle insertions and origins, and look at minute details of organs. Cyber-Anatomy Med VR™ is an advanced virtual reality turnkey system for learning anatomy. It offers 3D immersive stereographics technology that allows a user to visualize and to interact with complex anatomy through an intuitive and easy approach while in 3D. This is a turnkey solution. 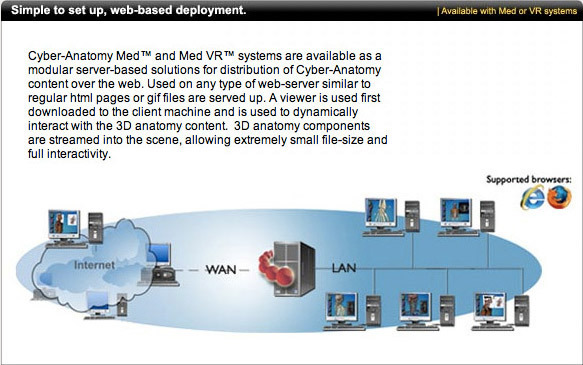 Cyber-Anatomy Med VR™ is an advanced virtual reality turnkey system for learning anatomy. It offers 3D immersive technology that allows a user to visualize and interact with complex anatomy through an intuitive and easy approach. This is a solution to answering the world's cadaver supply problems. The revolutionary system is comprised of an all-in-one box system and active 3D glasses that allow the user to set up in a matter of seconds. Educators and students are then able to dissect and manipulate anatomical structures while fully immersed in virtual reality. Cyber-Anatomy Med VR™ was developed by using the latest technological advancements adopted from gaming and graphics and by medical imaging and modeling methods that have only became available in recent years. The combined expertise of engineering simulation, programming, and medical imaging have rendered Cyber-Anatomy's products fundamentally unique in the market. 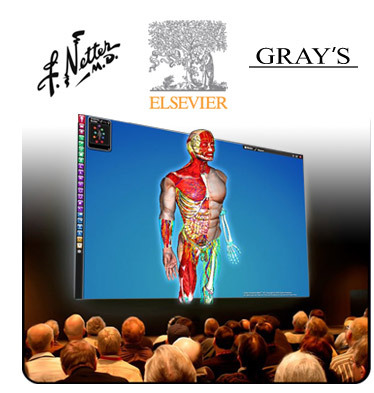 Not only does Cyber-Anatomy Med™ anatomy software provide these remarkable features, it also allows the student or teacher complete interaction and control of what is being studied. Comprehension andretention are elevated when the student can visualize and manipulate the anatomical structures in this manner. By using Cyber-Anatomy's patented visualization methods, students are able not only to view structures, but the interconnection of structures in a system - a fully comprehensive solution. Cyber-Anatomy™ software is intuitive and simple to install. Training is offered upon request.